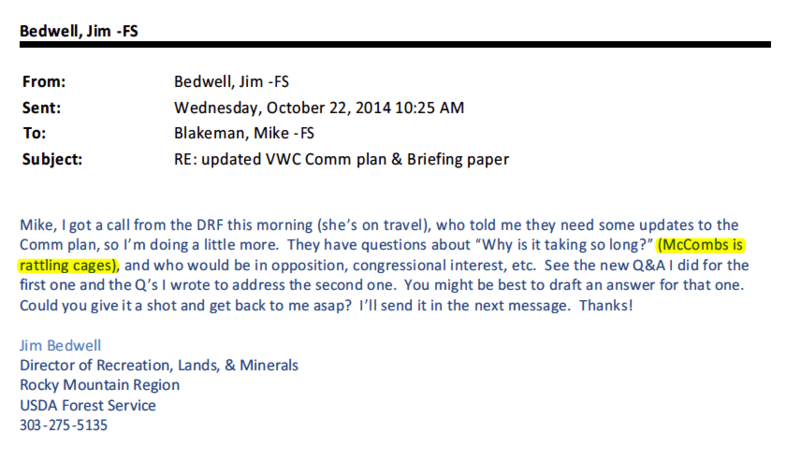 In this exhibit, we’ve picked a few emails from October 2014 from Jim Bedwell to other Forest Service employees. 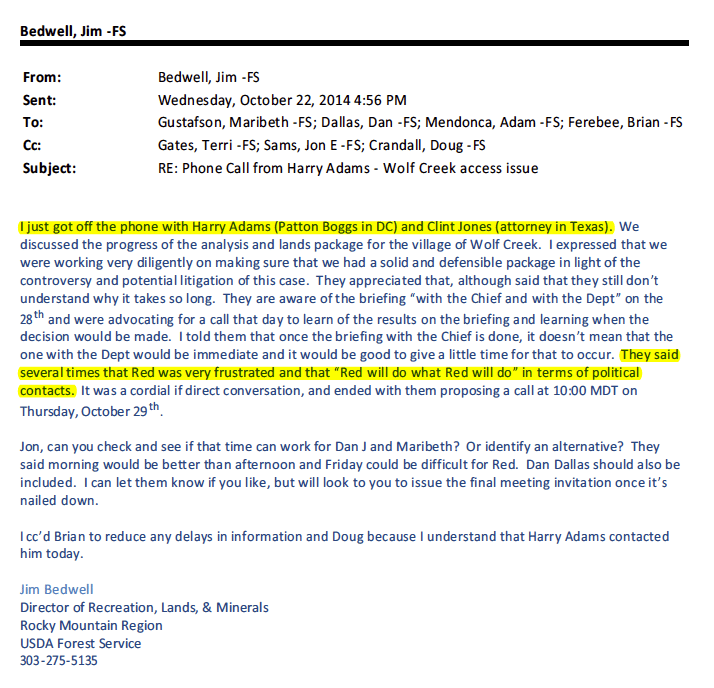 Bedwell continually cites regular phone conversations between Red McCombs’ lobbyists and government decision makers. See full email chain here. 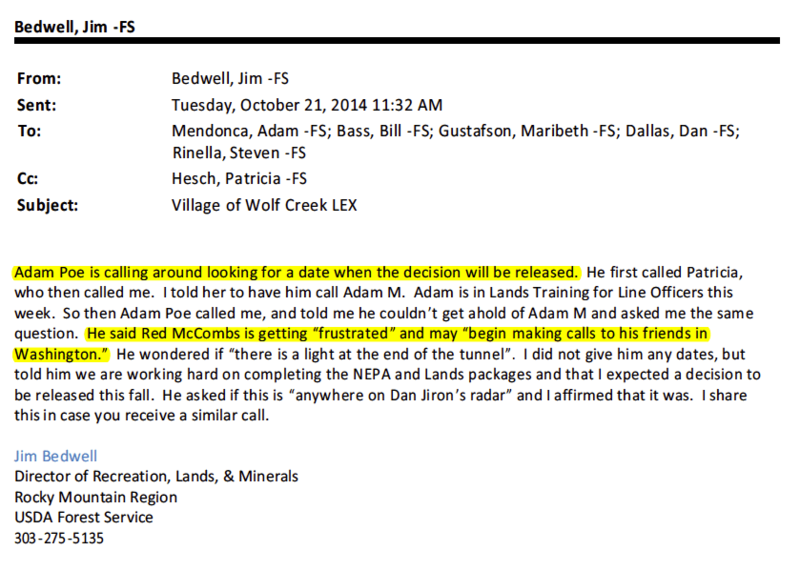 That evening Jim Bedwell sent out another email to Forest Service employees that he just got off the phone with Harry Adams and Clint Jones, two more of McComb’s lobbyists and was told that “Red was very frustrated and ‘Red will do what Red will do’ in terms of political contacts” because the EIS approval process was taking longer than he wanted it to. As a party interested in the results of the EIS, Red McCombs and his lobbyists are allowed to inquire about the process. He is not, however, allowed to use his political power to influence the decision. The emails above are three of many received thus far through Freedom of Information Act (FOIA) requests ** that confirm that many of these phone calls contained threats aimed at influencing the EIS analysis process and decision (See WCF Exhibit 3 for another). Red McCombs may be worth $1.5 billion dollars, but that doesn’t give him the right to use friends in high places to impact the decisions the government makes on the behalf of all citizens.